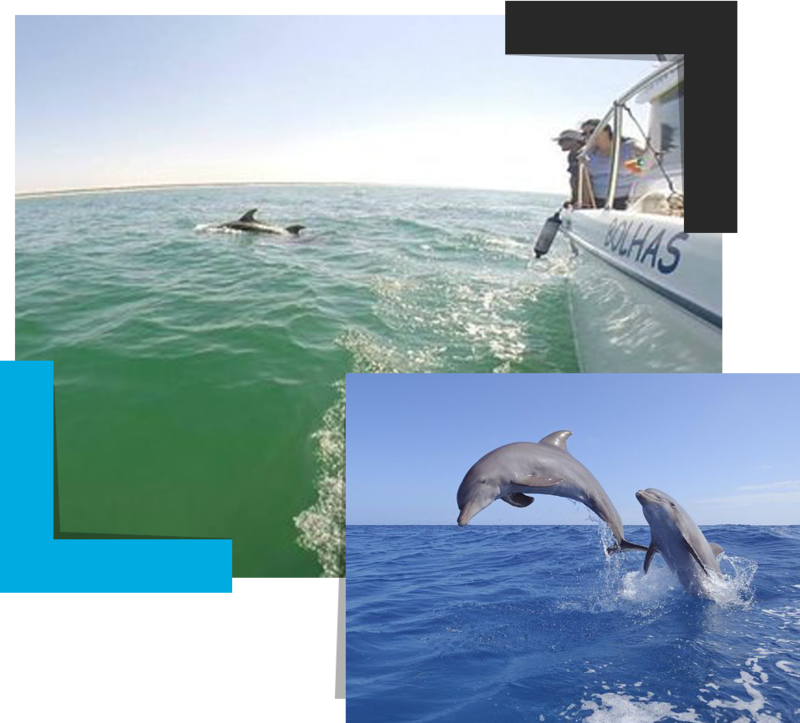 Team of Look Around Tours with crew of Bolhas MT propose to discover the ocean waters of Sesimbra and Setubal for a dolphin watching. This experience will be unique. The professional crew of fishermen follows you to the paths of dolphins and shows the places of habitats of Atlantic bottlenose dolphin well known as common bottlenose dolphin. Usually they live in groups called pods that typically number about 15 individuals, but group size varies from pairs of dolphins to over 100 or even occasionally over 1000 animals. in the stunning waters of Sesimbra and Sado estuary every day pass the dozens of pods. The watching of theese magnificent and friendy mammals will be unique and extraordinary experience of your journey! During the tour on the confortable boat you will try the typical Portuguese Moscatel and we will have a stop in the bay for snorkling. We also do the pick-up and drop off at your hotel or other kind of accomodation. » Drop-off at the hotel. We offer sport fishing activities that will make your fishing day a remarkable experience. 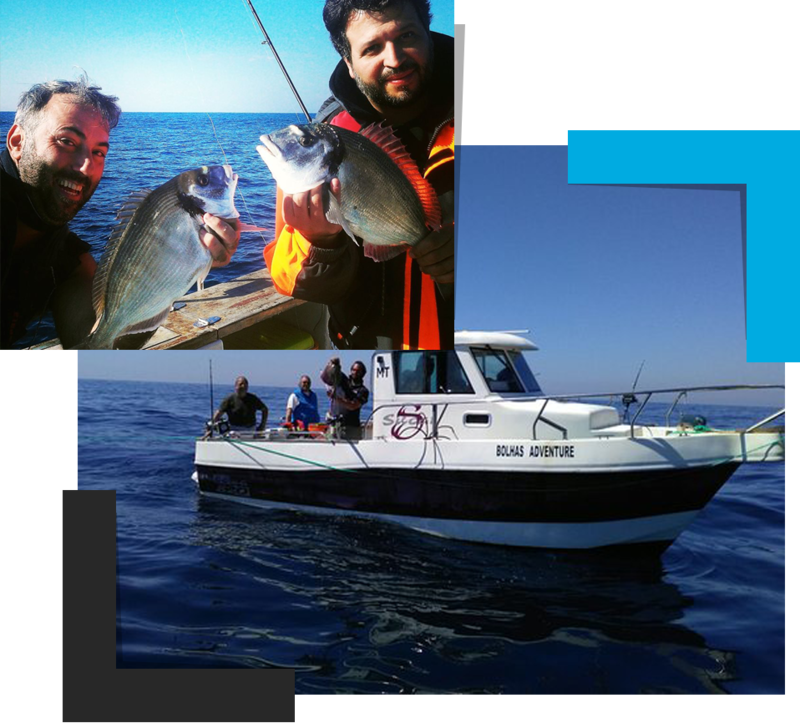 We perform different types of boat fishing, depending on the time of year, focusing on fishing for bream - November, December and January, fishing for deep sea species and to fishing for Corvinas XXL - May and June in Lisbon. We conducted throughout the year, fishing trips by boat at Cape Espichel, Sesimbra, Setubal and Lisbon. We have at your disposal a experienced team and with all the necessary tackle for a fishing trip onboard with great captures! Gather your group and spend a day full of emotion and full of catch on board one of our boats! » Rod, Reel and Tackle. Deep Sea Fishing between 3 to 5 nautical miles from Sesimbra´s Harbour, fishing depths from 30 to 80 meters deep. Light wind jacket and water-proof footwear is advised. Breams, Snappers, Guilted head Bream, Congro, Groupers.